Learn about how to file your GST and HST returns in Kashoo. Note: Even though you can calculate your GST/HST owing in Kashoo, you still need to file your form and make any payments with the CRA (Canada Revenue Agency). Kashoo does not do this for you. Note 2: For filing PST, please find the website of your province's tax agency and you can follow our general tax filing instructions found in the Remitting Sales Taxes article. The CRA has a website set up to help you out, which you can find here. Just remember, that whether or not you owe money, you still need to file with the government. To file your GST/HST in Canada, you may find it helpful to get a working copy of the GST/HST form. You can access it here. You can download a PDF of it here as well. You can’t actually file with either form, but it’ll let you know what needs to be filled out. If you actually need a real form, than go to the government’s How to get a return page to request one. The official names of the forms are either GST34-2 (Personalized) or GST62 (Non-Personalized). The difference is, you guessed it, whether the form is personalized to your business or not. Generally, the GST34-2 form should be sent to you automatically, so if it hasn't been, contact the CRA. There are many ways to file your taxes and pay the CRA, so please view the CRA’s website here to see which way works best for your business. There are a few important dates to be aware of: your Reporting Period dates (From and To) and your Due date. Make sure you know these dates and file your taxes by the Due date. 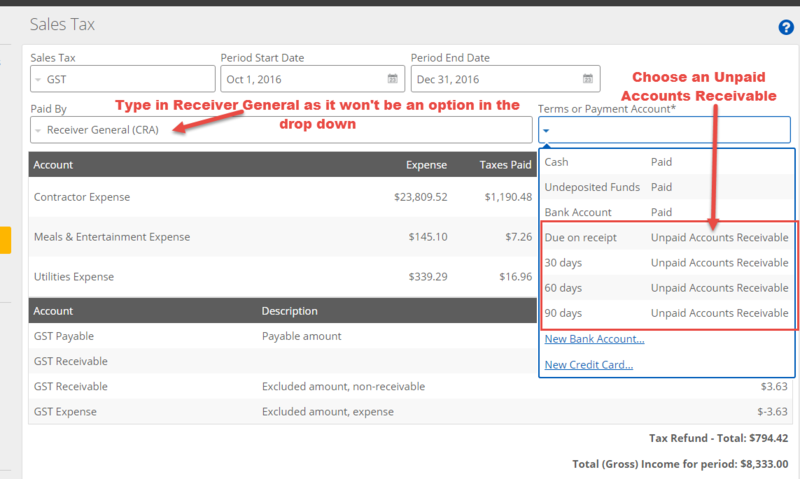 In the Reports section, go to the Income Statement page. The number on the Total Income line will be your Sales and Other Revenue (Line 101) amount. In the Actions section, go to the Sales Tax page. Select your Tax and enter in your Period Start Date and your Period End Date. Once you fill that in, two more fields will show up. Fill in the Pay To as the Receiver General (if you don't have the Supplier set up, add it) and the Terms or Payment Account according to whether or not you will be paying your remittance at the time of filing or not (if paying at the time of filing, choose a Paid account, like your bank account, otherwise choose an Unpaid Accounts Payable account, like Due on Receipt). GST Payable - Line 103. This is the money that you charge and collect when receiving income. This is usually a positive amount (in this example, $678.25). Tax Owing / Tax Refund - Line 109. If you are receiving a refund, we have the steps on processing a refund further down this article. You may have noticed the area in the File Sales Tax form that has % Eligible . You can use this field to only claim portions of taxes paid on expenses back, like only 50% of taxes paid on Meals & Entertainment. In the above example, $3.63 was excluded from our tax filing, so $-3.63 GST Receivable (Excluded Amount, non receivable) and $3.63 GST Expense (Excluded amount, expense). Once you are ready to file, select the File Sales Tax button to create the appropriate transaction in Kashoo (and remember, this only files the tax within Kashoo, you still need to separately file the taxes with the CRA). To see the Bill that was created, click on the Edit link. You should be all done. Don't forget to file your taxes with CRA. If you did not pay the bill at the time of filing though, follow the instructions below. 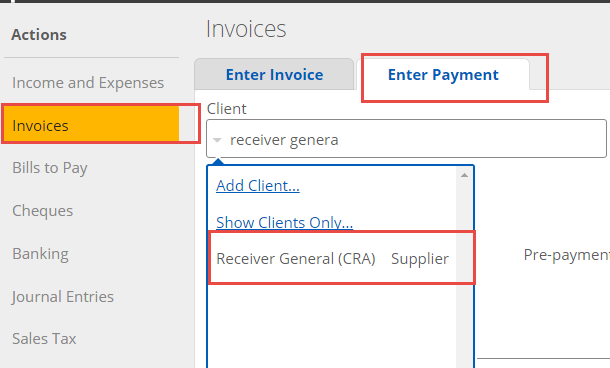 If you used an Unpaid Accounts Payable when choosing the Terms or Payment account, you can go to the Bills to Pay page and then the Enter Bill Payment tab to pay the Bill from the Receiver General. 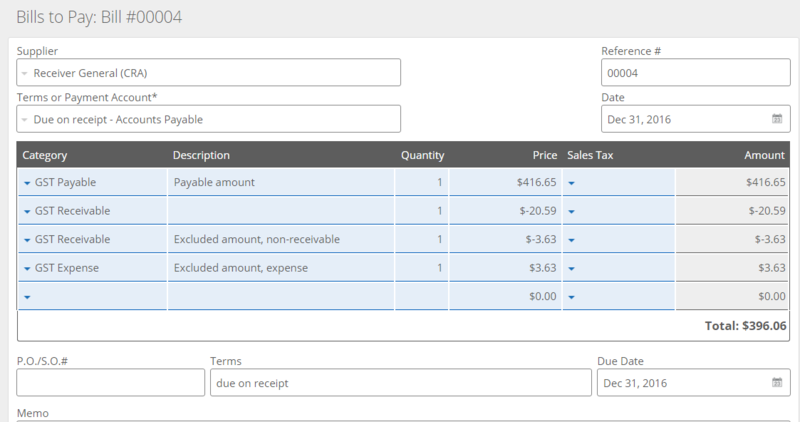 Make sure to choose a Date and Supplier name to see the bill. The steps above showed an example where money was owed to the CRA. If you happen to receive a refund (lucky you! 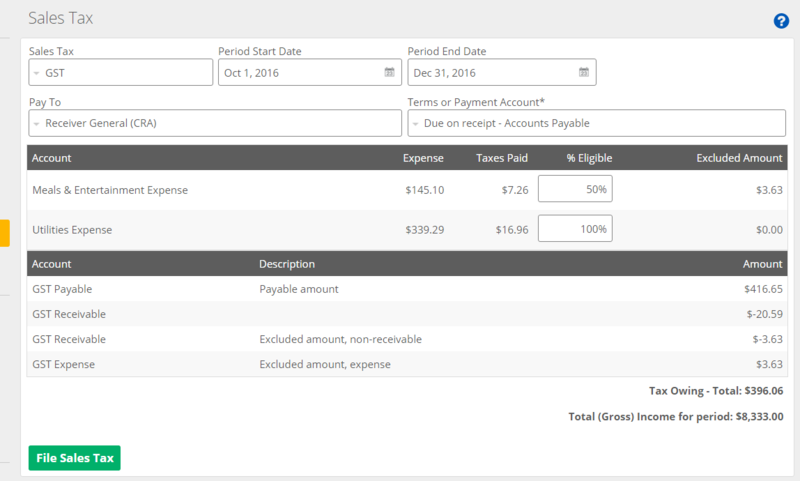 ), then you would change the Terms or Payment account to Due on receipt - Unpaid Accounts Receivable when filling out the File Sales Tax form. When you receive the refund from the CRA, go to Invoices and then choose the Enter Payment tab. In the Client field, select Show All Contacts amd select Receiver General. This will pull up the refund you’re expecting, at which point you can receive the refund into Kashoo. If you want to find out how to set up taxes in Kashoo, please go here. 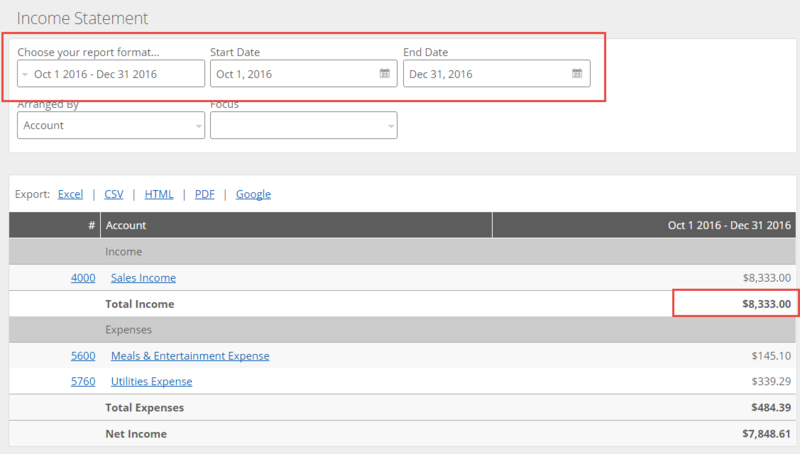 If you want to find out how to use taxes in Kashoo when entering income and expenses, please go here.